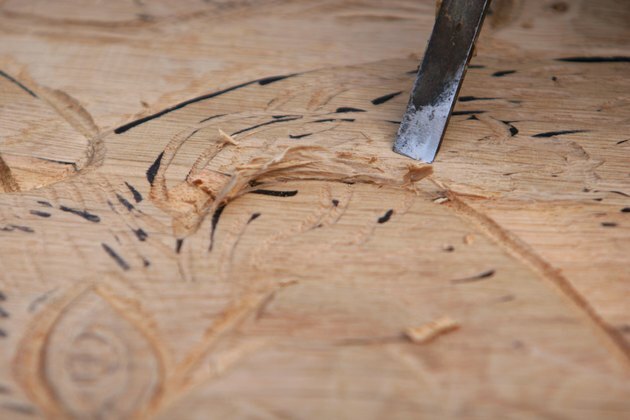 Removing thin slices, trimming or reducing the thickness of wood can mean different things. It might mean shaving a bit from a sticky door, trimming a piece of molding to fit or cutting a mortise for a lock or hinge. 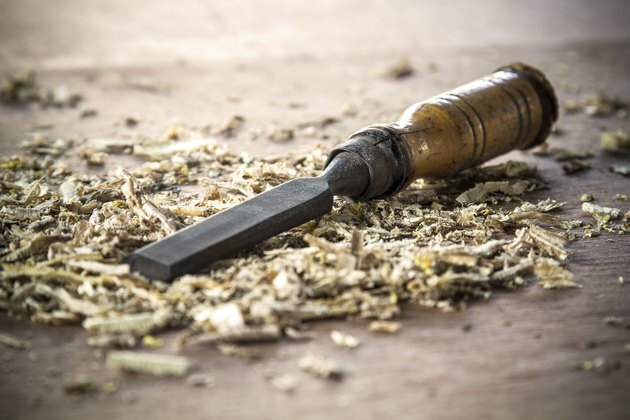 Some tools are designed specifically for removing small amounts of wood; other tools you probably have in your toolbox can be used to accomplish the same thing. A chisel is one of the most common shaving tools. A block plane being used to shave wood. With a razor-sharp blade protruding from the bottom at an angle, the block plane allows you to shave as little as 1/32 inch from almost any piece of wood. Carpenters use the block plane to shave wood from the sides of doors so they don't stick. Woodworkers use the block plane to trim parts when assembling a project to make them fit, taking off even, controlled amounts only where needed. The blade is adjustable for angle and depth by loosening a lever and twisting a handle. 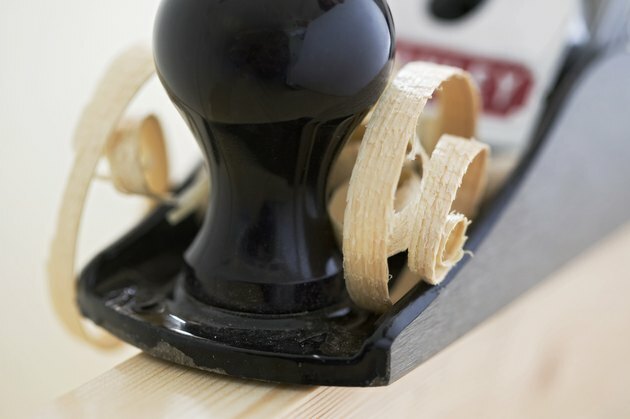 The block plane produces long, curly ribbons of wood when it's perfectly adjusted. 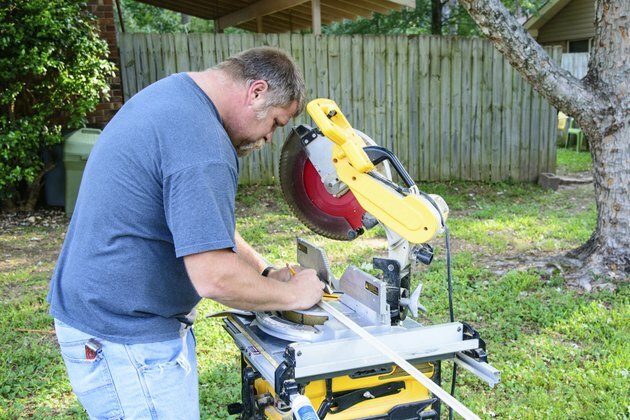 Man using a miter saw. Some of the best shaving tools come in powerful packages. Miter saws are capable of trimming clean, sharp ends or edges on molding and trim. Instead of cutting once and installing, cut molding long and whittle off thin shreds until the molding fits. The procedure may take four or five slices before the pieces fit tight. If the molding gaps, and it's clear the angle is off, adjust the saw 1/2-degree at a time and trim the ends again until the angles match. Miter saws trim best when they are equipped with a cross-cutting, combination or cabinetmaker's blade. If the blade has 60 teeth or more, it's fine to trim with; this also goes for table-saw blades. Table saws equipped with miter gauges and the right blade trim as good or better than a miter saw. Table saws typically use larger blades, and larger blades mean cleaner cuts. A chisel being used to carve a design. Almost nothing shaves more precisely than a handheld chisel. The common chisel -- if it's sharp -- can shave wood simply by rocking it while nudging it forward. Some applications, such as mortising for a striker, include tapping the chisel with a small mallet to trim a rectangular hole in the side of a door. The flat, angled nose of the chisel is easy to control and it doesn't take excessive force to cut deeply, shaving or trimming small slices as you go deeper. The all-purpose chisel is one of the most widely used tools for trim carpenters and woodworkers. Trim or shave delicate projects using a utility knife. A utility knife comes in handy when cutting thin veneer for patching or trimming custom-made plugs to fit gouges or holes in wood. The utility knife has a sharp, pointed blade with enough backbone to cut through wood up to about 1/4 inch. 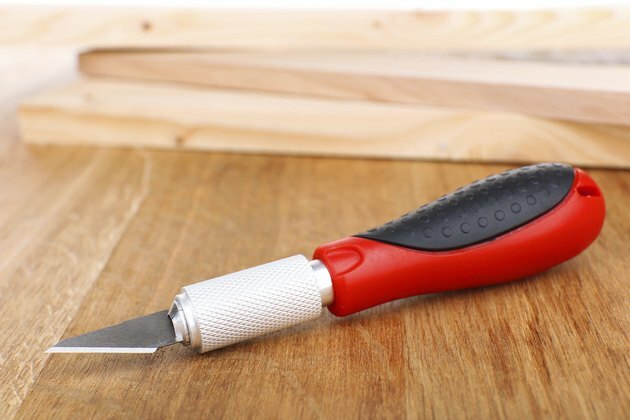 If you have a gouge or smashed area on wood, use the utility knife to trim out fibers, splinters and loose material before fashioning a patch from a fresh piece of wood. Carpenter filing a wood chair. 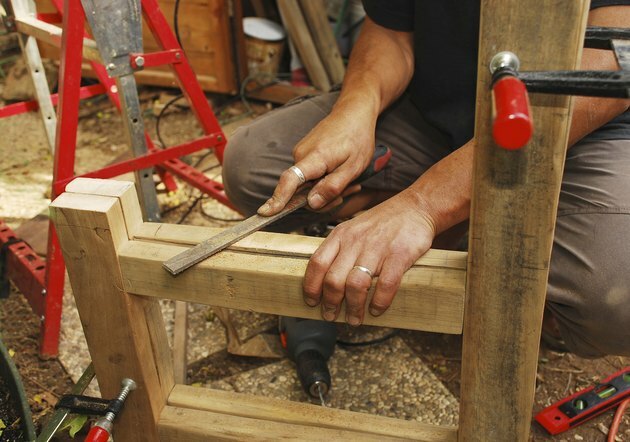 Use a file or rasp to shave tenons that don't fit mortises or dowels that don't fit corresponding holes. A problem can occur at the wrong moment when pieces are glued and the assembly is in progress. The tenon or dowel won't fit the corresponding hole and you only have minutes to trim it before the glue dries. Keep a file or rasp -- or chisel -- handy for a quick shave so you get the project assembled before the glue dries. Dry-fit all the pieces ahead of time. If you find some of the parts don't fit the way they should, use a file, rasp or chisel to trim off the corner, edge or high spot so everything fits tight. Saw blades don't always cut straight, clean joints. Sometimes, they cut at an angle, chip or splinter the end or side of a piece of wood. When the two pieces are assembled, it reveals a hairline crack. 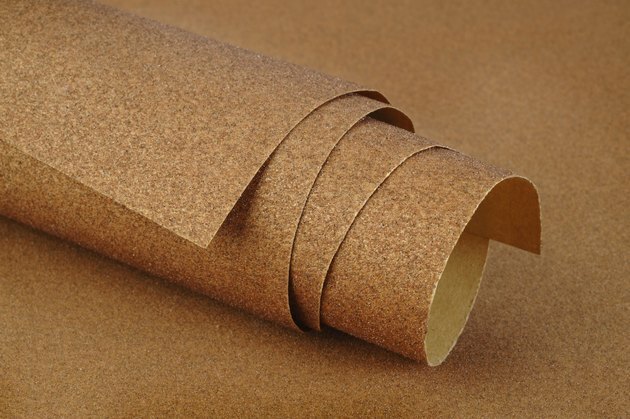 When this happens, nothing works better than sandpaper wrapped around a wood block to flatten and square a joint or end. If the crack is substantial, an orbital sander removes wood more aggressively -- but use caution with a power sander as it's easy to shave off too much. For high spots, chips or splinters that won't lie down, oscillating tools work wonders for precise shaving, removing material only where you need it removed.